“Nature is not, of course, always benign and beautiful. It can be frightening and terrifying also. Not too many generations ago, raw nature and wilderness tended to inspire fear and dread in "civilized" people. They represented Otherness and the Unknown. That which is "wild" is also "bewildering". In Wildness is the preservation of the world.” Who else but Henry David Thoreau could have expressed so beautifully mankind’s tryst with nature? He says somewhere else, “I went to the woods because I wished to live deliberately, to front only the essential facts of life, and see if I could not learn what it had to teach, and not, when I came to die, discover that I had not lived.” If something can best sum up the experience of 24 adventurers in Chitradurga district (~200 kms from Bangalore) nestled in the wilderness, these quotes would come very close! Indeed, a city with all its attractions and scope for entertainment, fails to offer its inhabitants, the opportunity to enjoy some finer pleasures of life – the pleasures of hearing the sounds winds can make or those of seeing a rusty gate leading to a battered pathway covered in dense fog! 24 people from different backgrounds and professions signed up for an adventurous event – the Jogi Matti Adventure camp organized by Nisarga. There was little else except a strong passion – a passion to explore nature and indulge in adventure – that connected all of us. At the end of 3 days though, through the course of some demanding physical activity, we found enough common interests in each other to exchange numbers. It all started with a mail – so attractive was the itinerary that I decided to be part of it in almost no time! The journey to the base camp till the forest department guest houses at the Jogimatti hill station was infused with a lot of anticipation and excitement. As people got in and settled in their seats, the introductions and conversations slowly started. The most happening row was the last row with Nilesh alias Niles bhai, Vijetha alias Viji, Vinay, Raj and Jayalakshmi uproariously crackling with laughter. Nature has its own unique way of often, exposing humanity for what we really are – almost a nonentity when compared with its combination of ferociousness and generosity. 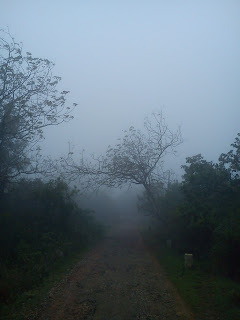 The fog and the chillness in the atmosphere, thanks to the windy conditions, were the first signs of our encounter with raw nature – unblemished, untrammeled, pristine and towering in its entire splendor. The watch tower, as we climbed up to it, was inviting. With every step up, our hearts filled with fresh, unpolluted air – lots of it! Reaching the top, we wandered to the corners to have a look at the surroundings. The fog teased and lured us – it hid more than it revealed and the titillation was almost sexual in its rawness. Our instructor Prabhu -with his child like smile, he captured our hearts over the next 3 days – elaborated on the geography of the place; freezing cold winds that can topple cars and a wildlife encompassing sloth bears and leopards – it thrilled us no end!